News and updates about the Stakeholders project, and other basket-related work. It’s been a long time since I’ve written a post about the Stakeholders project – indeed, it’s been a long time since I’ve had a chance to do any work on the project – but in the past couple of weeks I’ve finally been able to turn my attention back to my beloved baskets and have now added all the information that we gathered during the study visit to the catalogue. This isn’t the sort of skim-the-surface cataloguing that I’ve done for other projects at MERL – it’s much more in-depth. 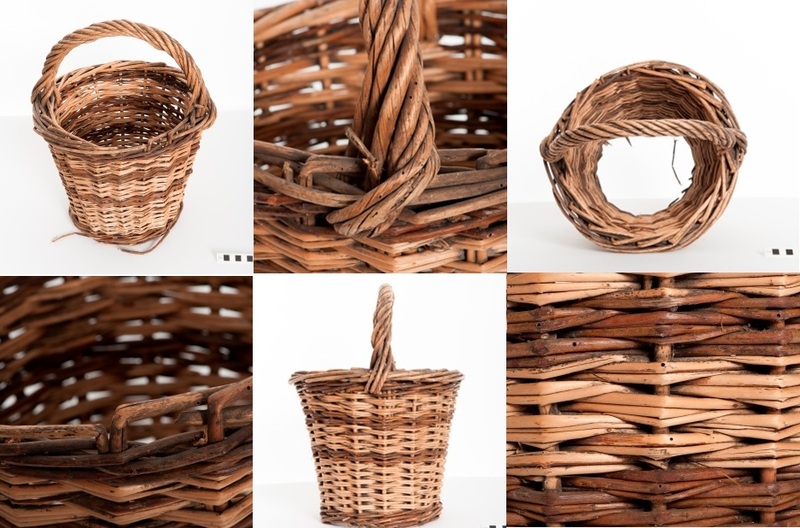 There’s now so much detail about the baskets that it’s like going from one extreme to the other. I’ve typed up the recording forms that were completed during the visit, making a few amendments for clarity, so that all the details are available and can be brought up in a free text search. I’ve also attached scans of the original forms as well. I’ve then focused on adding the overall/general technique used*** (coiled, stake and strand, knotted or netted, plaited, twined, assembled), the main materials used, and providing more detailed dimensions. I’ve also edited the general descriptions I wrote when I catalogued the baskets first time round in summer 2012 to incorporate the additional information gained through the project and to ensure that all the details are correct. The records now also have a really good set of photos attached to them – both general and close-up shots. Back in January we spent a very long day taking photos of about 65 baskets (the Stakeholders baskets plus those without colour photos) and ended up taking over 650 photos! And finally, as part of another project, I’ve been working through the entire collection (nearly 19,000 records) to give everything a new and standardised set of keywords – as a result, all the baskets, basketwork items and basketry tools now have keyword ‘basketry’, which can be used as another way to find them on the online catalogue (using the ‘subject’ field in the advanced search). 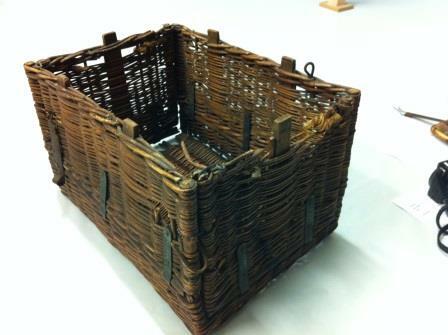 So have a look at the online catalogue and explore some of the baskets! *** Technique refers to the overall construction of the basket. I did think about keywording for all the different techniques (e.g. slewing, randing, pairing, fitching, waling, etc.) but there were several issues with this: 1) I don’t fully understand them, which makes cataloguing a challenge; 2) I’m wary of filling the thesaurus with extremely niche keywords; 3) one basket can use so many techniques – indeed, one part of a basket can use so many techniques – so it all becomes extremely complicated to catalogue and makes the records unwieldy; and 4) I’m not sure there’s an awful lot of benefit to cataloguing in quite so much detail, especially as that information is present in the recording form (both the scan and the transcription). If you happen to be in Reading today with nothing to do (4 February 2014) why not pop along to MERL at 13.00 for our lunchtime seminar? This series of talks, entitled ‘Untouchable England’, looks at how different forms of intangible heritage might help us explore and better understand rural England. Today’s seminar will be given by… me! And I’ll be talking about basketry skills as intangible heritage, examining the idea of heritage craft, exploring values that basketmakers ascribe to their work, and looking to the future of intangible craft skills. After the talk there’ll also be an informal pop-up exhibition of baskets in the Museum’s mezzanine store and a chance to talk more about MERL’s current Stakeholders project. P TAR PH3/2/13/3/24. John Tarlton Collection. 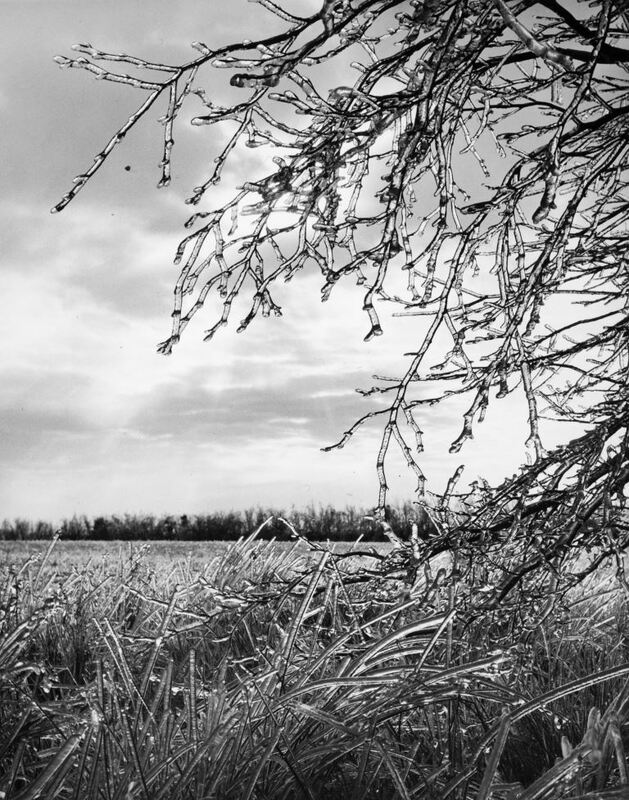 Black and white photograph entitled Great Frost – as the sun breaks through on New Year’s day the ice glistens on every blade and branch, Exmoor. Happy 2014 to all of you MERL Projects Blog readers! I can’t believe how quickly 2013 went (or how long it is since I last did a blog post). The start of a new year is always a good time to look back at what you’ve achieved over the past 12 months, and to look ahead to what you want to achieve in the coming months. Yesterday was my first day back in the office after a lovely break, so I took the opportunity to write a January-February 2014 To Do list – and there’s an awful lot on it! A Sense of Place: We just managed to enhance 9000 records at the end of 2012, and our current total at the end of 2013 stands at 15805 records. This progress is largely thanks to Laura, who was working on the project for several months over the summer while Felicity and I moved on to other projects (although we did manage to fit in some cataloguing too). This means that there’s only another 3000 records to go until every record has been enhanced – something I’d really like to see done! I’ve also been starting to tidy up (and hopefully massively reduce) the list of object names (and their numerous variants) when I have a spare moment or two. Countryside21: This has been a bit of a stop-and-start project, and we’ve made really good progress on some elements and virtually none on others. The positives include nearly finishing the Time Based Media survey (I’m aiming to have it signed off by the end of January), renaming thousands upon thousands of files and restructuring the way they’re organised (all Felicity’s work), revising the MERL Classification, rationalising our use of subject keywords in Adlib, and finally beginning to implement the new Classification and the associated keywords (I’ve already managed to do this for 3400 records in the space of two weeks). We’ve also updated the ‘Geographical Keywords Manual’ and will be putting together guidelines on how to use other types of keywords in the coming weeks. The ‘To Do’ list includes selecting and keywording images for commercial purposes, and arranging the technical side of the project such as the Digital Asset Management software and the e-commerce. Reading Connections: While we don’t blog about the Reading Connections project here (it has a separate blog) this has been occupying a lot of mine and Felicity’s time throughout 2013. We spent the summer photographing 600 of Reading Museum’s Historic World Objects, and since then Felicity has been spending several days a week at Reading Museum researching and writing detailed descriptions of these objects. Meanwhile I’ve been working on cataloguing craft here at MERL and have enhanced/tidied/cross-referenced all of the records for clay, leather, metal, stone, straw and textile crafts, leaving just wood crafts to go in 2014. Stakeholders: We had a hugely successful two day study visit from ten basketmakers at the start of December to kick the project off. We’ll be photographing all of the baskets we studied in a couple of weeks, and then it’s a case of adding all the new information that we gathered to Adlib, commissioning pieces from the participating makers, and putting together some banners for a pop-up exhibition in the future. Our Country Lives: While not officially one of Felicity’s and my projects, we’ve both been involved in the plans for the re-development of MERL over the last couple of months of 2013. It’s been a really eye-opening experience and we’re very much looking forward to how it progresses. Miscellaneous: And as ever, we’ve been working on lots of other bits and pieces too. Our volunteers have continued to scan the 60-series negatives and add them to Adlib. 3000 negatives were scanned in 2013, leaving only another 5 boxes (out of a total of 23) left to do. I’ve been adding any existing colour photos to Adlib which for some reason weren’t already on there – I’ve done the 1970s, 1980s, 1990s and 2000s, leaving just the 1950s and 1960s to go. So, all in all, a very busy year just gone (with much more than I’ve managed to mention), and another busy year to come (again, with much more than I’ve managed to mention)! 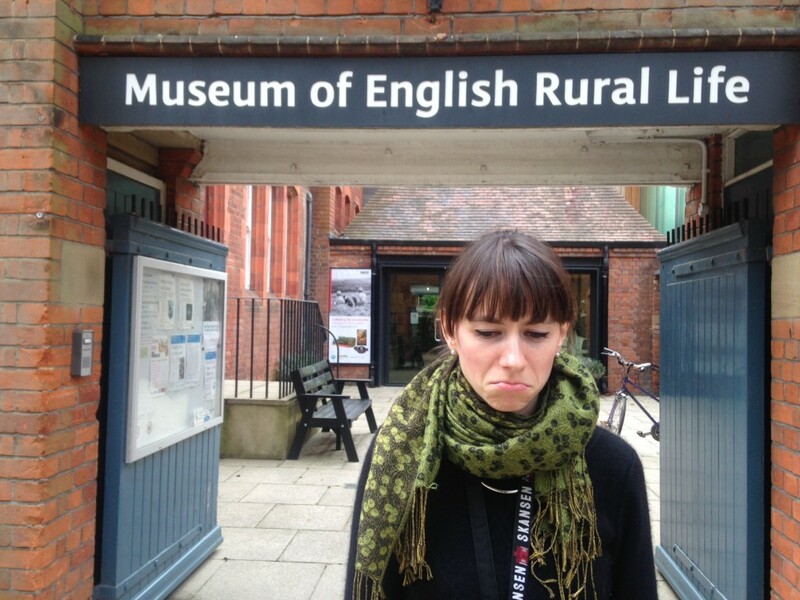 But, at least I can say that I’m really looking forward to 2014 here at MERL and all there is to do. Wishing everyone all the best for 2014! We followed up the success of the first day of the Stakeholders workshop visit with an even more successful second day. 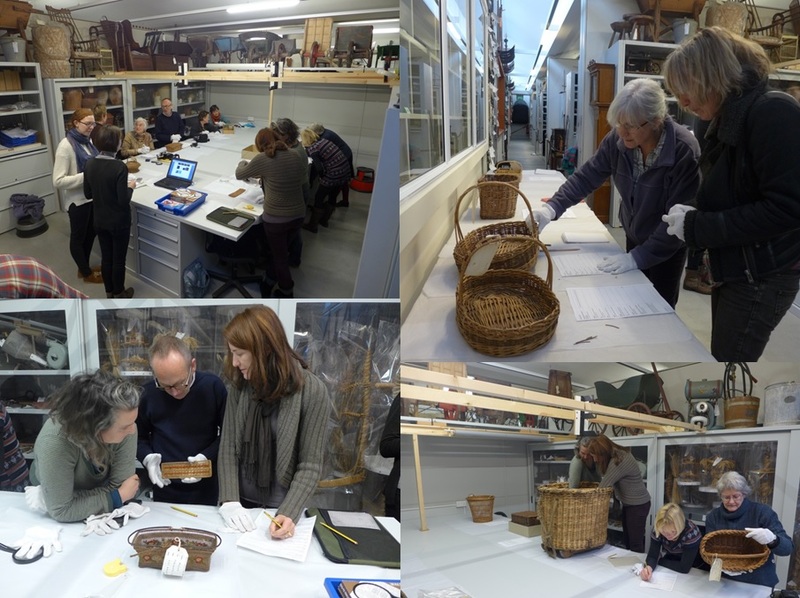 Working in pairs throughout the two days, our expert makers looked at over 45 baskets and recorded incredibly detailed information about each of them. I was really pleased that we managed to get through all of the ‘high priority’ baskets, and made a good start on the ‘medium priority’ ones – as well as giving everyone the opportunity have a look at anything they were particularly interested in. The recording forms have all been scanned and I will hopefully be attaching them to the records next week. I won’t get a chance to do the proper cataloguing until the new year but in the meantime I will endeavour to post about some of the baskets that were looked at and share what we’ve learned about them. One of the most fascinating elements of the visit was listening to the conversations that were going on and the questions that everyone was asking of each other – ‘what would you call this?’, ‘have you ever seen anything like this before?’, ‘is this typical of English work?’ and so on. The main focus of the whole project is the sharing of skills and knowledge, and it was wonderful to see this in action. As well as the rich information recorded during the visit, I’ve also gathered various tips and pointers on places to look for further information, which books to look in, well-known names to look out for and that sort of thing. We were all pretty exhausted by the end of the two days – a lot of concentration on behalf of the makers, and a lot of to-ing and fro-ing on our part getting all the baskets out and putting them away again. I hope that everyone went away feeling satisfied and inspired! It will be interesting to look at everyone’s work in a year or so to see if it has been shaped or influenced in any way by the things that everyone saw at MERL. A huge thank you to all the makers!!!! Just a very quick post to say that we’ve had a really successful first day of the Stakeholders workshop visit to MERL. 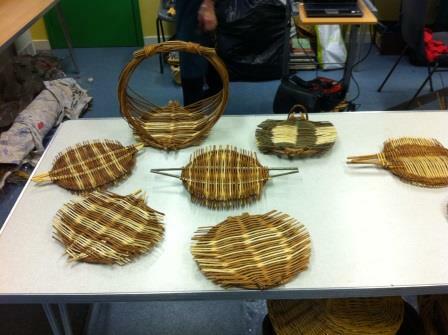 Our basketmakers have been great – so enthusiastic, and so knowledgeable! We’ve probably looked at about twenty baskets so far (good thing I prioritised them) and everybody’s written such detailed notes, and it’s been wonderful listening to everyone sharing their expertise. We’ve looked at some truly amazing baskets – and some truly hideous ones too! We’re all looking forward to another basket-packed day tomorrow. 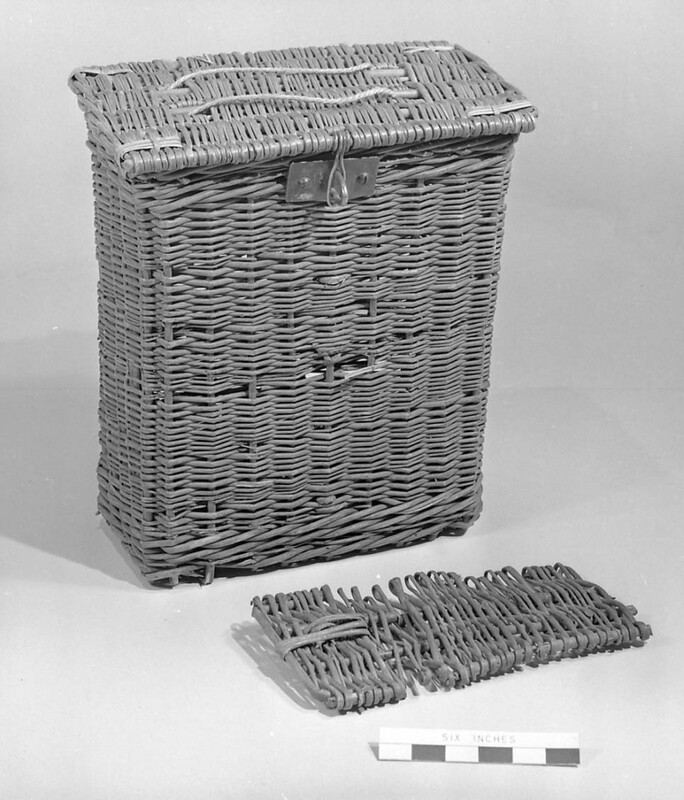 … MERL 70/196 And a folding post office basket which packs down to about 4 inches in height. This is a to-scale model, but the full sized version was never made. MERL 64/200. This is one of the High Priority baskets. Although we have some information on the materials it’s made from, we have no details about its construction. 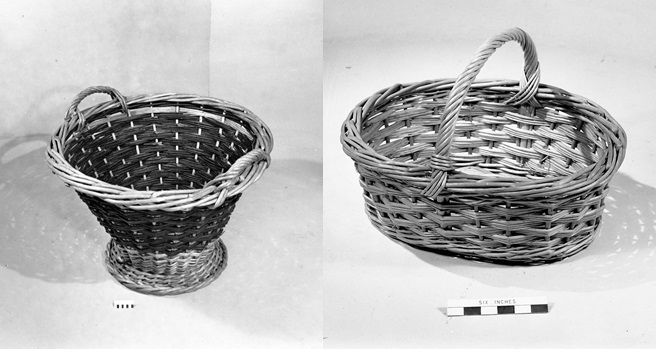 It is thought that this basket may have been used for samples by the Water Board. We’re nearly ready to welcome the ten basketmakers to MERL next week to take part in the two-day study visit as part of the Stakeholders project. I’m very excited that it’s finally happening – it seems an awfully long time since July when we heard the project was going ahead! I’ve nearly completed all the preparations for the session. I’ve finally managed to organise the baskets into high, medium and low priority categories, and I’ve created a recording form which I hope is easy to use and reasonably consistent with forms that have been used in the past. For each basket, I have printed out the current Adlib record and photocopied the form onto the back – this way, we’ve got ready access to the information we already know about each basket and can easily identify the gaps that need filling. There are still a few remaining bits and pieces to do – like making sure there’s room in the Museum store for us all, getting the first few baskets out, and making sure we have enough pencils – but I think we should be good to go on Tuesday morning! I think it’s going to be a very busy two days, but hopefully I’ll find time next week to blog about how it all went. Although it’s going to be very intense, I think that in some ways the study visit is the easy part of the project. I think the challenging part will be inputting all the information we’ve gathered into the catalogue in a logical, consistent, searchable and user-friendly way (which will hopefully tie into the work I’ve been doing with thesaurus terms as part of the Countryside21 project). I’m also hoping to do some follow-up research in the MERL Library and Archives where necessary. Then there’s the commissions aspect of Stakeholders still to think about, arranging photography of the baskets which currently have no photos, and putting together some form of exhibition from the project – be it online, or in the form of banners for a pop-up or temporary exhibition. But challenging or not, I’m really looking forward to getting stuck in! How do you read a basket? 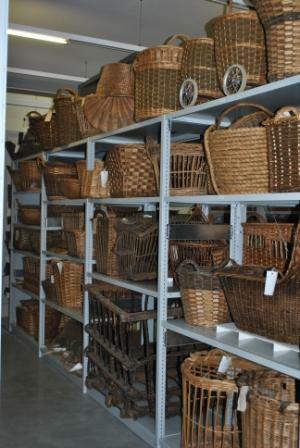 The amazing array of baskets we got to look at and (very unusually for people who work in a museum) handle freely! Life at MERL is a little bit manic at the moment as Our Country Lives has somewhat taken over all of our lives, and finding time to make progress on all of the other projects we’re working on isn’t easy! However, while everyone else spent Monday battling with storylines, themes, subthemes and object selection, I spent the day at Gressenhall Farm and Workhouse in Norfolk learning how to read a basket – all in the cause of Stakeholders of course! 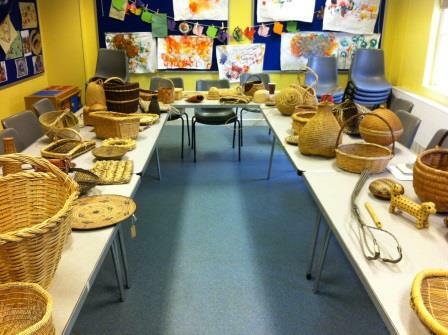 The training was hosted by SHARE Museums East and run by Mary Butcher, President of the Basketmakers’ Association and font of basketmaking knowledge, who will be joining us at MERL next month for Stakeholders. 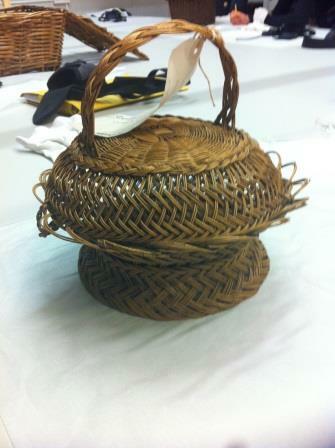 The training was intended for museum staff and volunteers to help us identify the basics or our basketry collections, such as key materials and techniques. Mary talked us through the six key basketry techniques – coiling, twining, plaiting, netting/knotting, stake and strand, and assembly – and then set us the challenge of grouping the baskets she’d brought in from her own collection of world basketry. There were some spectacular baskets and it was quite a challenge in some cases. Next up was materials. 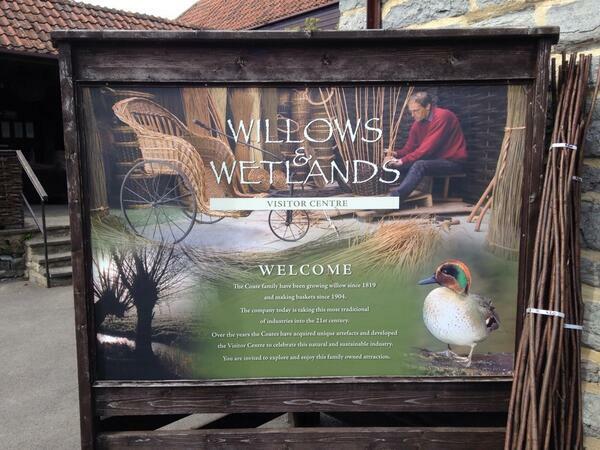 Willow, cane and rush are the most common materials used in British basketry. There are three ‘types’ of willow – white willow (cut and then peeled between April and June – the fancy stuff), buff willow (boiled and then peeled – the everyday stuff) and brown willow (cut and dried with the bark on – the rough stuff). 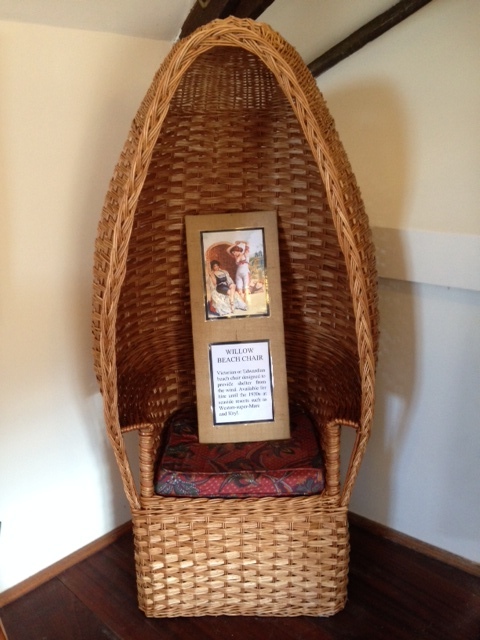 Cane is a general term for rattan, and is identified by the distinctive ‘nodes’ where the leaves had once been. Cane can be used as whole cane, split cane, and centre cane. We also touched on some of the different materials used around the world – Mary had examples of dockage (dock leaf stalks – Shetland), birch bark (northern Scandinavia, Russia and Canada), esparto grass (Spain), pine root and orchid root. Basketmaking tools are quite simple. Mary also gave us some tips on how to spot an English basket. For example, the way the handle is fixed is a key indicator – English baskets often have a ‘cross’ handle while Eastern European ones are lapped. Another difference can be seen in the way the stakes are positioned in the base of an oval basket – in English baskets they poke directly into the base at right angles to the edge whereas in every other country they are bent to the side so that they are parallel to the edge (I think!). 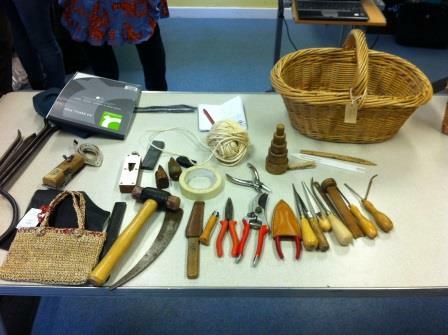 Mary also showed us the range of tools used in basketmaking (all fairly low-technology) and I was pleased to know that I recognised most of them from last summer’s cataloguing work. She also gave us a demonstration of making willow skeins – splitting the rod into three with a cleave, and passing it repeatedly through a shave to remove the pith and make it thinner and thinner and thinner. The best – and most unexpected – bit of the day was the hands-on element. We got to make some rush rope in the morning, and in the afternoon we made a Catalan serving tray. I’ve seen these made a few times so it was really fun to finally have a go myself. As Mary said, having a go with the materials is the best way to understand them! Some of the Catalan serving platters we made on the day – mine is middle left.